Others Custom nets, accessories and installation service are available. 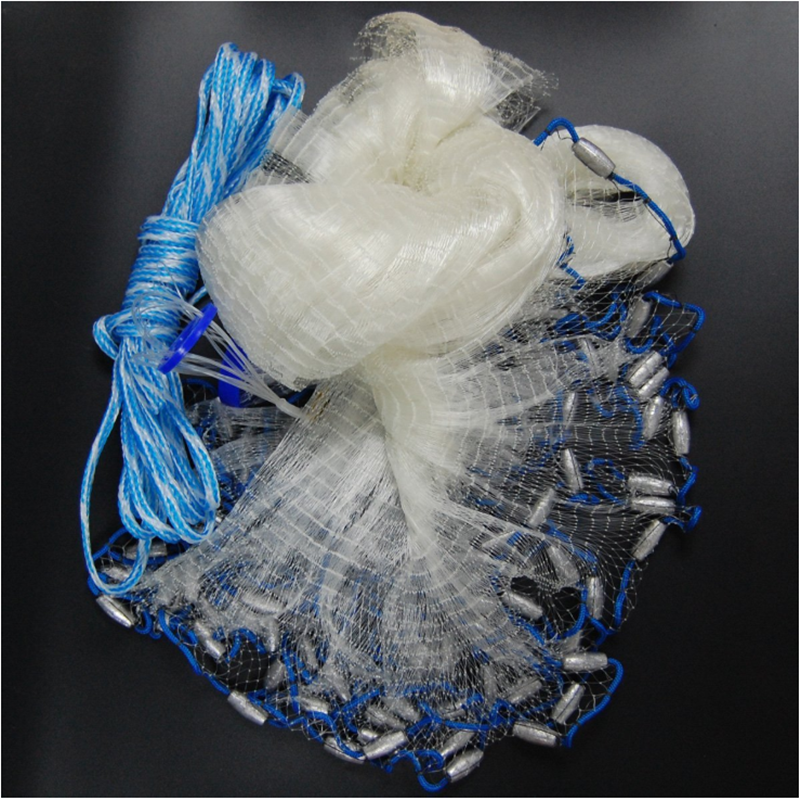 -All the nets and accessories can be manufactured according your requests. -100% new and ready to use. -Built with a 3/8 inch square mesh for catching both large and smaller bait fish and can be used in both fresh and salt water! -This net is great and will save you money from not having to buy bait when you can use this item over and over to catch all the bait you need to catch fish! -This item is perfect to pack away and very easy to use. -Has heavy sinkers so it can also be used in places with stronger currents. How to choose a suitable cast nets? Most recreational cast nets are offered in radius sizes from 3 to 10 feet. A 6-foot-radius net will open to 12 feet in diameter if you throw it right. Commercial nets can range to 15 feet in radius, but maximum sizes vary by state, and in some states cast nets are prohibited. A 7-foot net is only marginally larger than a 5-footer but offers over twice the coverage, which allows you to catch more fresh bait with less effort. The optimum size of the net’s mesh is based on your targeted baitfish. The mesh size that you select should be small enough to avoid “gilling” ­baitfish, which hastens their demise in the livewell. 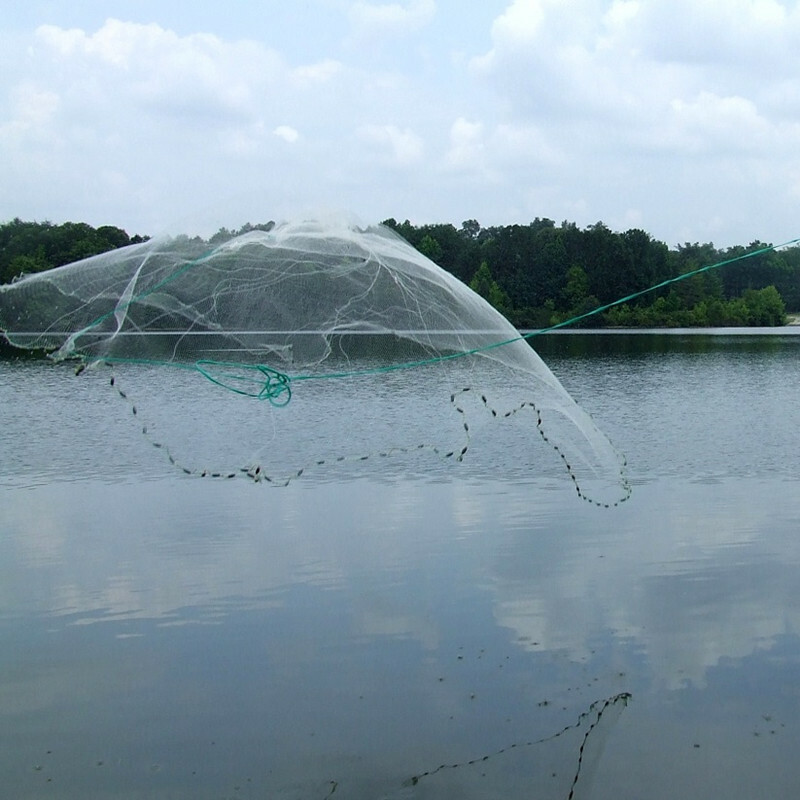 Cast nets are typically offered in ¾ pound, 1 pound and 1½ pounds of lead weight per foot of radius. These lead weights are equally spaced at the bottom of the net. The rule of thumb is the more lead and the tighter it’s spaced, the faster the net will sink and the more bait you will catch with each throw. However, a net too heavy to throw catches nothing, so know your strength. There are dozens of ways to throw a cast net, some of which are determined by its size and weight. There are literally hundreds of videos on YouTube that show some of the nuances, so choose one that works best for you. There are 101 uses for the ubiquitous 5-gallon bucket on a boat. … Well, make that 102, since this is the perfect container in which to stow your cast net in between engagements. Be sure to give it a freshwater rinse after every use, gently compress the monofilament panels, and feed it lead side first into the bucket, coiling the polyethylene hand line in a neat loop on top.